Jack Antonio conducted an interview with former L.A. GUNS and current DEVIL CITY ANGELS guitarist Tracii Guns on the August 3 episode of "Do You Know Jack?" radio show on CKLB FM. You can now listen to the chat using the Mixcloud player below. 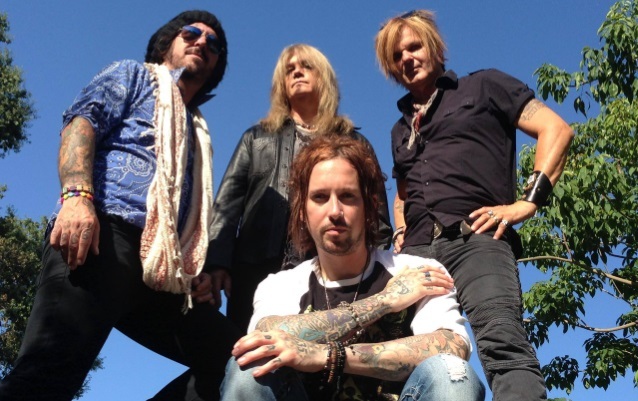 DEVIL CITY ANGELS is the new band featuring Tracii Guns alongside drummer Rikki Rockett (POISON), bassist Eric Brittingham (CINDERELLA), and vocalist/rhythm guitarist Brandon Gibbs (CHEAP THRILL). "It was kind of by accident how it came together, it really was," Tracii told Lithium Magazine about DEVIL CITY ANGELS' formation. "Rikki and I had done a John Entwistle/Keith Moon tribute show together. We went backstage after playing our songs and the guys backstage were all kind of chanting, 'Guns and Rocketts, Guns and Rocketts' as a joke. And we kind of laughed it off but then Rikki suddenly turned around and said, 'Guns and Rocketts' actually has a pretty nice ring to it, don't you think. So we decided right there to start a band." Guns, who has a solo project called LEAGUE OF GENTLEMEN, continued: "[LEAGUE OF GENTLEMEN is] more of a vanity project. I wanted something that I could go and tour with and be in a real band. We thought of a few different players and Rikki said he knew Brandon. He said he knew this guy who was younger than us, but should have been born decades earlier. He had a real bluesy sound and played with Eric. We decided to check him out so I called him and he was a really cool dude. And before you knew it, we had him ask Eric if he was interested. He said absolutely and they flew out here a couple weeks later and we recorded [our] first song [called 'All My People']." Regarding "All My People", Tracii said: "The song was written by Rikki and Brandon a couple of years before. They each did their parts separately and then we did the vocal tracking. They went home and I spent the rest of the time doing the lead guitar stuff. And we sent it to Anthony Focx, who is an amazing engineer and mixer who has worked with [former] METALLICA [bassist Jason Newsted] and AEROSMITH and a bunch of other bands. He is a good friend of ours and he mixed it really good and we put it out." He added: “It was eight days from recording to releasing it. It was beautiful the way it came together, kind of old school." Tracii also spoke about DEVIL CITY ANGELS' musical direction, saying "It's basic. It's simple. We might groove out a little more on some things and we might have a ballad or two. But other than that, we're going to keep it pretty straightforward 1977 rock. Since we have a winner with 'All My People', we are just going to stay in that framework. We feel that kind of music and Brandon surely delivers it."